Go, Tracy, Go! : Giving myself a 4-day weekend! TRAINING STARTS TODAY OMG I AM SO EXCITED YAYAYAY!!! Sometimes I wonder what it would be like to be a teenager these days... to say things, earnestly, like "OMFG" or "ROTFL." I may not have a particularly sophisticated command of English, but I can honestly say I've never used "LOL". I don't have too much else to say today because I'm off running! Yes, training technically started yesterday, but yesterday was a rest day. So I'm starting my training today with an easy 4m + 10x100m strides. I've never done strides before; isn't that weird? Fartleks, occasionally. Speedwork, sporadically. Strides? Never. 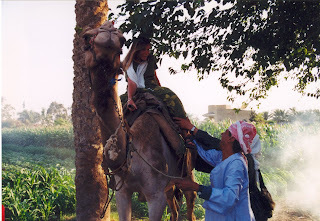 Enjoy a photo of a much younger me about to fall off of a camel until I have more about my training schedule for you tomorrow. I also did some speed work today! 3m total, .25 at 8:30mm pace on the treadmill, with .5 recovery I think (that's how tired I was!). I'm wishing for a nap now. Fantastic photo! And i look forward to hearing about your training. I have never incorporated fartleks, hills, speed, etc into my routines. i always just go "Run X miles". I look forward to learning from you!